With more mulching and planting around my trail and more water lines along side it, we have feared potential development on Chloe’s Lane for some time. But with all of the houses on Officers’ Row in the park behind it sold for millions, a more affordable alternative has sprouted right at the elbow of my favorite fetch route. Neither Mike, Heather nor my good pal Charlie had a clear explanation of what it was exactly, or who was responsible for it. Whether the work of kids, illegal campers or beer-drinking teens, we’ll probably never know. All I know for certain is that the thing is in my way, and I want it gone by the time I come back from vacation. Chloë soaks up advice from her broker. When we drive to Magnolia Village on a Saturday morning, it’s usually to walk through the farmers’ market, which is not my favorite thing to do (too crowded for my taste). But last week Mike and Heather had a different market to deal with, something they called the stock market. 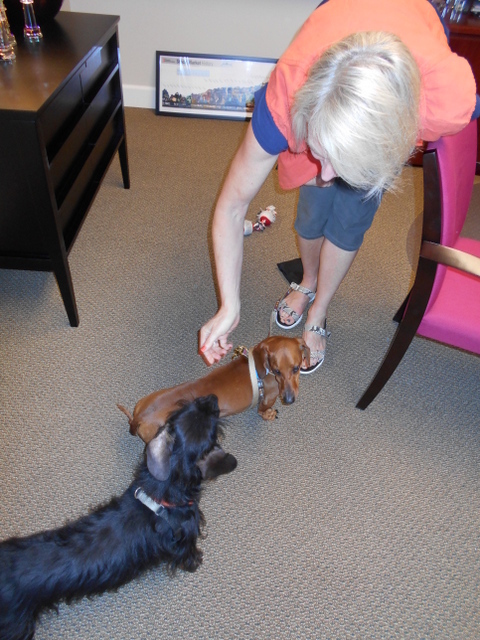 They had an appointment with my friend Caroline, who has two dachshunds of her own. She was going to give them information about retirement, which as I understand is something that happens in the distant future that allows Heather to stay home every day. This sounds good to me; I hate to see Heather spending time on weekends pouring over patient report forms when the two of us should be napping or throwing my ball around. Reaping the early rewards of financial planning. 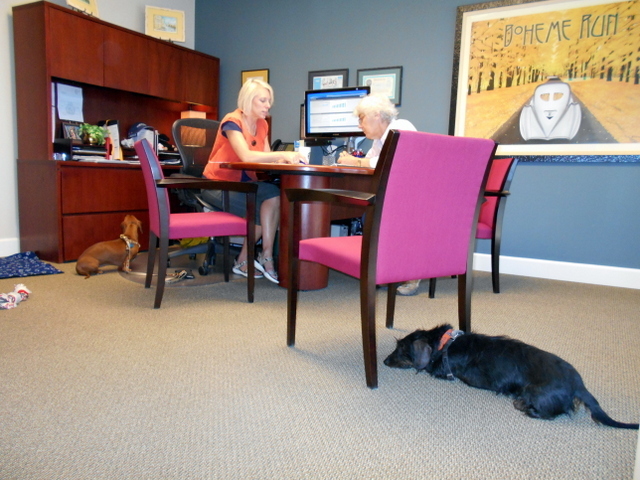 When the meeting ended, Caroline gave treats to Ida and me, and Ida didn’t growl at me once. That made everything fall into place in my mind: This investing business has its ups and downs, but if you stay calm and patient, you’ll be rewarded at the end. Makes perfect sense to me. My life is all about socialization these days. There are so many things that I need to be exposed to before I’m six months old. Such as cats and dogs and rabbits and trains and boats and people of all kinds. Last week I met a cop (who was covering a suicide in Discovery Park, no less), college girls in weird costumes, a teenager with spiked hair, a garbage truck, a bus with a loud air horn and several motorcyles. And those are just a few of the ones I remember. Chloë herds Tsavo, a Rhodesian Ridgeback. 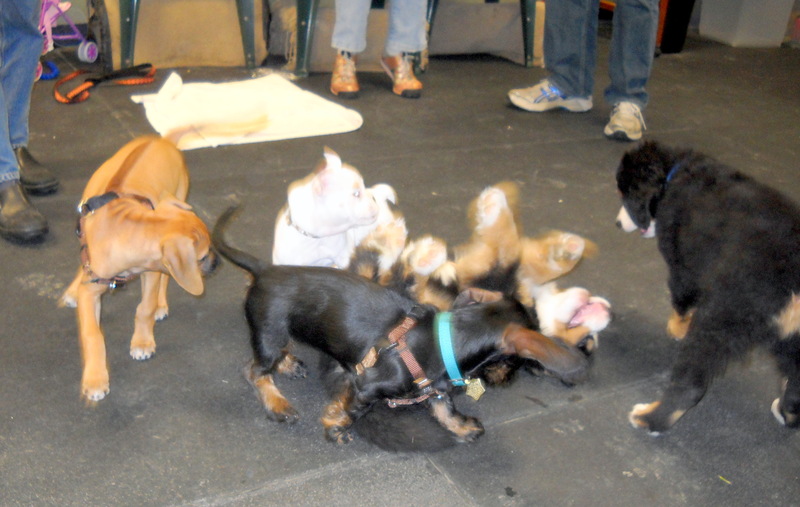 First we went to my weekly Puppy Kindergarten class. It’s called a “class,” but they’re really not teaching me much there. Mostly it’s the teacher telling Mike and Heather and the other owners what they’re doing wrong at home, and the puppies playing. 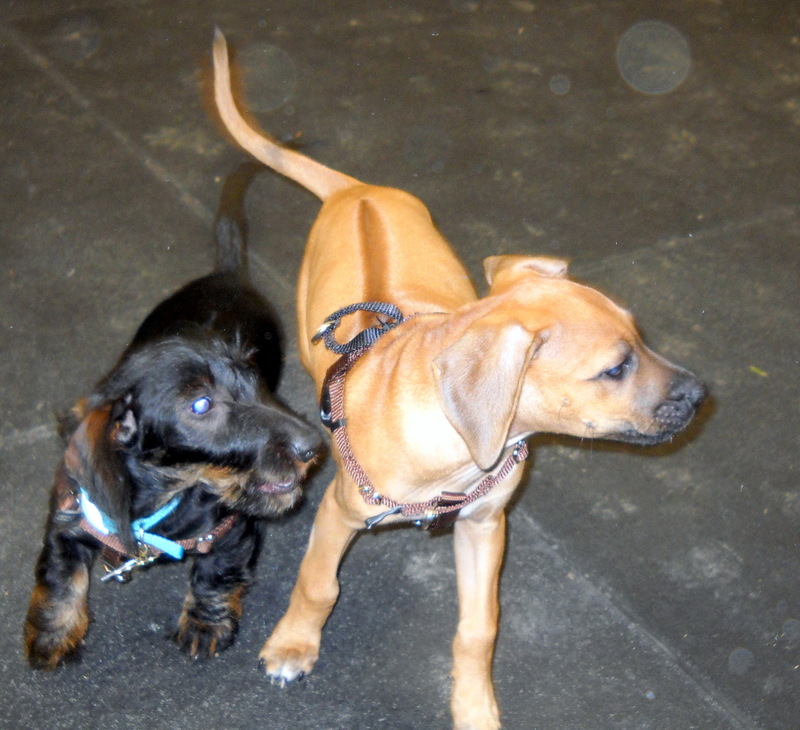 I always get to play in the group with the puppies who are larger and more rambunctious, but it really doesn’t matter who they are, I am always the puppy in charge. I’m a benevolent despot, however, and so I allow all the puppies to receive lots of the little treats they use (the teacher gives out pieces of real chicken!). If the other pups are anything like me after one of those classes, there’s a lot of pooping going on all afternoon. Then we went back home, where Mike and Heather had invited 10 of their SU sports-watching friends over to meet me. Well, to meet me and eat some of that slow-cooked pork that Mike was cooking. The aroma drove me crazy for the past two days. 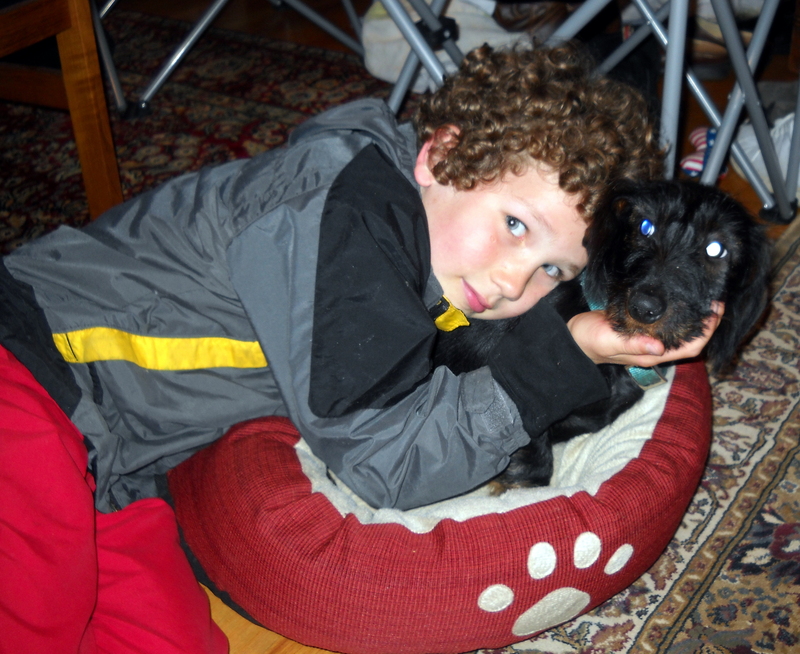 Logan and Chloë share a quiet moment at her Pork and Puppy party. I had never seen so many people crowd into this little house before, but everybody said that I handled it fine. Even when those kids Logan and Leah were all over me, I maintained my composure. I’m hoping to cultivate close, personal relationships that will pay off down the line in future walks and treats in sizes much larger than those tiny training bits. 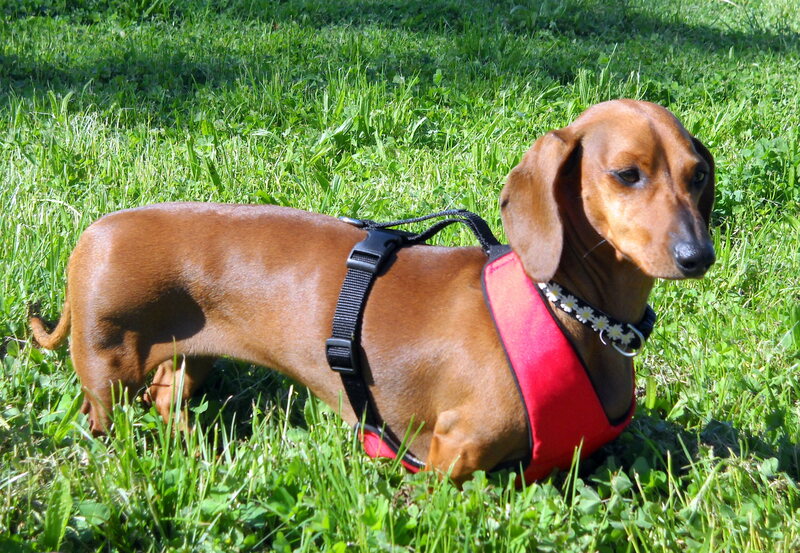 The sun finally peeked out for a while on Memorial Day afternoon, and we drove to our secret playfield to meet my personal stock broker Caroline and her two dachshunds, Pinot and Ida. 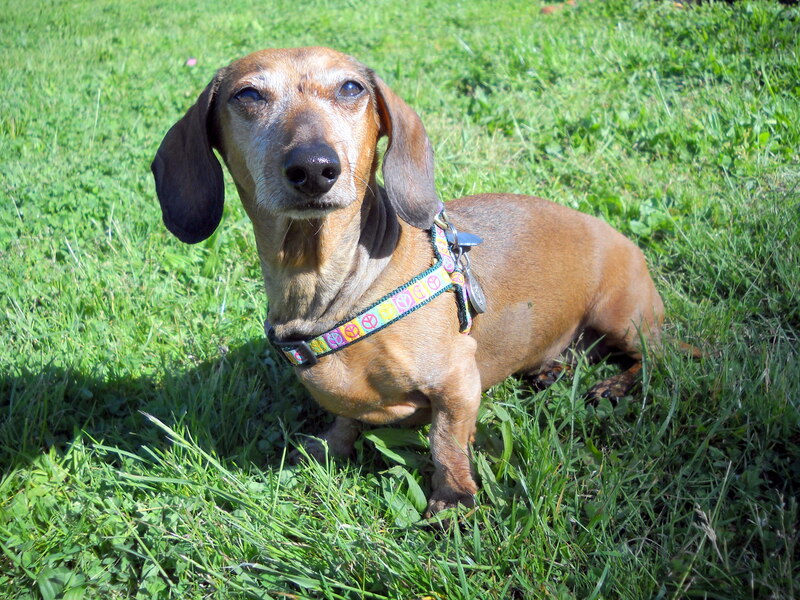 Pinot, a longtime admirer and fan of the blog, was the more fun of the two, but she’s still recovering from serious health issues, and she just can’t mix it up with me like my homeys Frank and Stan. Hey, I may be just a puppy, but I understand when to turn it down a notch. That’s the point of all this socialization stuff, right? Ida, though–that poor girl has some issues to work out. Caroline recently adopted her from another Magnolia family that couldn’t keep her anymore after a new baby changed their pack dynamic (I’m not dishing out any more poop on that situation). Ida, who is about 4 years old, seems nice enough, and she’s a redhaired beauty to look at, but she’s obviously lacking in confidence and has limited social skills. I guess it’s just going to be up to me to help bring Ida out of her shell. I’m going to start slowly, but eventually I’ll have her out there butting heads with Frank and Stanley, no problem. Not right now, though. 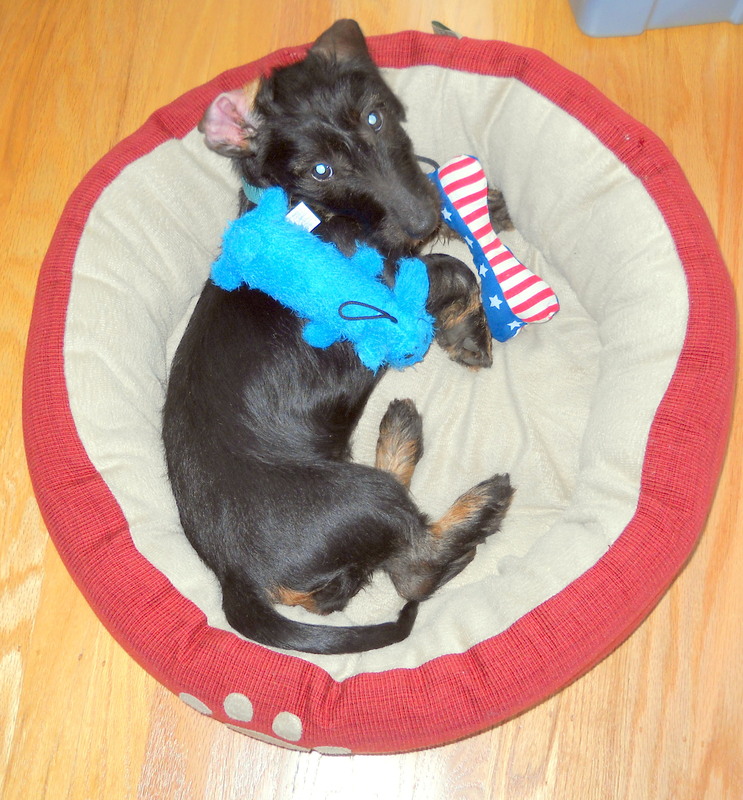 I think I’ d rather wiggle around in my bed with the gifts I got at my Pork and Puppy party. Let’s just chill, and tackle the heavy stuff later. Chloë shows off her party swag.